A team of professionals will often assess cognitive skills. The team includes a Speech-Language Pathologist (SLP) in addition to psychologists, social workers, teachers and/or occupational therapists. They may give formal and informal tests to check many different cognitive skills. Such tests may not fully measure how well a person might function in real-life situations, so the SLP and other team members may also observe the client during normal daily activities. Therapy activities will vary widely depending on what cognitive problems are present. The main goal will be to improve the client's ability to complete daily activities (e.g., self-care, school work, job skills) as independently as possible. The SLP will teach family and possibly friends, teachers or bosses about how much help the client needs with different tasks, and how best to assist him. The SLP will teach the client compensatory strategies to help work around cognitive problems. These are systematic ways of doing things that use a person's strengths to overcome his weaknesses. Some examples include: decreasing visual and auditory distractions in the environment; using aids such as paper or electronic organizers, calendars, alarms, and checklists; and breaking tasks down into separate steps. 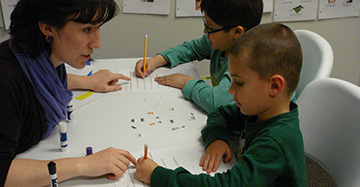 SLPs may also use paper/pencil or verbal activities or computer programs to improve impaired thinking skills by practicing memory drills, attentional focus, visual spatial skills, reasoning tasks, etc.